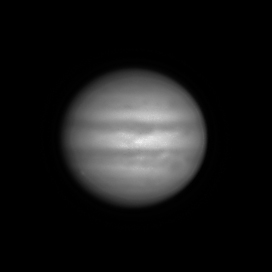 Last night I managed this image of Jupiter and I would appreciate your tips on how to improve it. 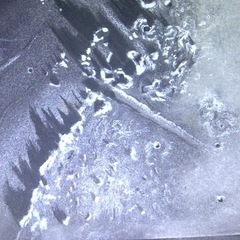 Equipment was 200P on HEQ5 with ASI120MM and Televue 2.5 powermate. Captured in Firecapture beta. 60 seconds. 512x440. Gain 41. Exposure time 13.65. 72 fps. Gamma 26. Processed in Virtual Dub, Castrator, AS2 and Registax 6. Whilst content with the image for my first with the new camera, I know better will come. 1. Should I have taken a 2 minute AVI or is 4,300 frames enough? 2. Is the main problem I am out of focus and should work more on this next time? 3. I notice a slight onion ring. Have I overdone the sliders? Your advice as always would be most appreciated. Not bad for a first effort with a new camera. I think there is a bit of onion-ringing going on, which can be a case of exposure or gain set too low. I use the histogram tool in firecapture to ensure about 80-80% of the ADC range is used. This helps a lot. Focus is always a hassle, and I use the moons quite a lot to judge focus. My best shots with the ASI120MC to date have been at F/20, so maybe you can go beyond the F/15 which you are using. Michael many thanks for this, and I will take "not bad for a first effort" quite happily. I will make a note to check out the firecapture histogram - thanks again! My first capture with the ASI120MC was a good deal worse. The histogram is very useful for balancing gain and exposure. I tend to select the exposure to get the frame rate I'm after, then adjust the gain to get a suitable histogram. If that means the gain is much getting over 60% then I may well think about increasing the exposure time. It is all a bit "touchy feely" though. James - thanks for popping in! Are the required frame rates and histogram shapes trial and error or has a good starting point been established? I must invest in a motorised focusser one day. I'd say the histogram is important to get close to right whether it's 70% or 80% won't kill you, but if you don't have enough dynamic range in the image then you'll be struggling for data to process. Frame rate is up to you really, but anything between 30fps and 60fps is probably reasonable. Fast is good, but requires more gain and gain means noise, so again it's something of a balancing act. 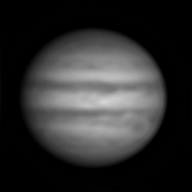 as for you jupiter image, that certainly isn`t too bad, did you try the wavelets in registax to sharpen the detail any ? my first effort with the mono asi 120 was about just as good as yours, i was trying the filters aswell to get a coloured image, you have to be quick, 30 seconds on each colour and i luminance with a manual filter wheel, very tricky L.O.L. I did use the wavelets Red, but even with the top one at 100% it would not sharpen any more, which confused me somewhat and made me think I was out of focus. I did have a go at capturing Mars but it appeared very very wobbly (fairly low in sky i know), perhaps something beyond my ability and equipment? But will try again! I do have an external focuser on the C9.25 which should make things a little easier when it comes to motorising than my 127 Mak where I drive the focuser knob directly. It's only a Revelation dual-speed R&P model though. I'm unlikely to use the C9.25 for full disc lunar and solar though, so the external focuser removes the mirror problem and hopefully makes for a simpler motorisation mod as well. I've started with the PST first though as I have the crayford focuser on that and there are at least screws to fit a bracket with. The R&P model has a dearth of potential mounting points, so I need to engineer an alternative for that. Played around with the wavelet sharpening option, although could do with a guide to be honest! First good results with newly purchased ASI224MC camera. Using: CPC800, ASI224MC (USB3), ZWO IR cut filter, ZWO ADC. Conditions: planets low (15 deg or lower), near full moon, some haze. Time : around 04.40 BST. A few hours earlier I tried Mars but the results were poor asides for demonstrating the higher frame rate available with the new camera. In case you are wondering (as I was) what the difference is between an ASI224MC and an ASI120MC, the former does not appear to be any more sensitive so far as I could see (exposures no shorter) but the potential frame rate even with USB2 is higher. And the ASI224 has a deeper body for some reason. And this set of Saturn images is clearly my best ever. 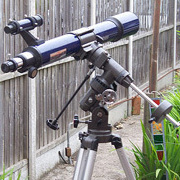 Ideal magnification for planetary viewing. Hey guys. Thought about starting this thread. 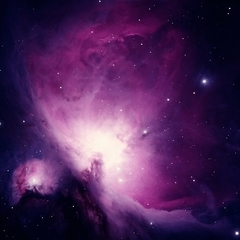 I feel like we all should inform eachother and newer members alike about the magngifications that can be achieved on planets,that provide the best sharpness/size ratio,depending on the scope and seeing. After this thread has grown a bit, i feel like this should be pinned,as to provide a little guide to newer members that are not experienced with planetary observing,as many will be fooled with the typical 50x per inch of aperture and get disappointed when they find that that image will be dim and blurry. For Saturn i like to use 150x in medium seeing and if i want something a bit bigger , switch to 240x ,which will give me a bigger,but blurrier image.iBut In good seeing, i found that 240x was very usable.When we have perfect conditions, i m certainly trying 300x. Mars, isnt very big in the sky right now,so even at high magnifications like 300x it still appears as a small orange dot. For observing mars,I suggest waiting for it to reach opposition.It benifits hugely from it! However,this happens once every 2 years....But 5ere are other planets to keep you occupied until then, such as jupiter,saturn and Venus. For Venus, i use 50-100-120 depending on its phase. For Jupiter, i like to use 150x, as it provides a very sharp image,with key features of the planet such as bands being very detailed.Waiting on my 6mm UWA Skywatcher to bring it to 200 and see how that plays out. Be careful! Don’t magnify jupiter too much, as it will loose much of its features and sharpness. Neptune and Uranus: These two will not impress, but are certainly have a nice colour to them. Even ar high magnifications, such as 300x and 400x, they will look like small discs with color in them.Uranus will look be colored green and Neptune a fainter blue. 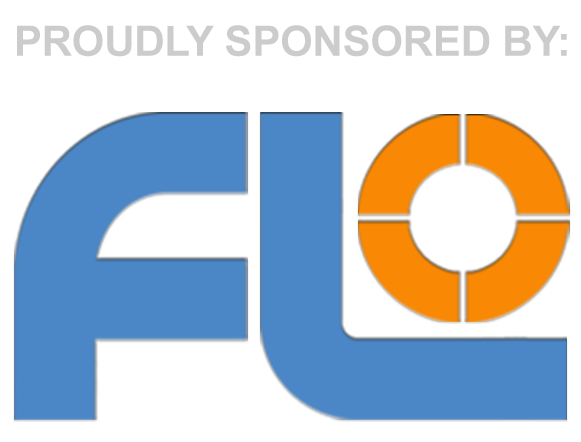 Feel free to give your own opinions as to give members a wider source of information to help them observe better ! Finally got decent images of Jupiter with my CPC800. I was beginning to worry that I had invested in a setup that was inferior to my C8 SE.🙄 The CPC800 mount is far nicer to use; it's much easier to get the image on chip and keep it there. And the GPS saves some time and effort. CPC800, ASI120MC, ZWO ADC, captured with Sharpcap, processed in Registax6. Dunedin, New Zealand - Sunday public nights starting! Proudly announcing the southern hemispheres NZ astronomy main event opening every Sunday from 7.30 pm, from the 7th April. We welcome visitors and can accommodate you in our beautiful, dark, southern town. p.s This is Dunedin, New Zealand, not Dunedin, FL! Jupiter, saturn, Mars 25 March. Got images of Jupiter and Saturn in the morning and a tiny Mars in the evening. Saturn was very low and a fence may have blocked some light. Apparent diameter of Mars is now below 5" and the evening seeing was poor. Used: CPC800, ASI120MC, ADC, processed in Registax6.